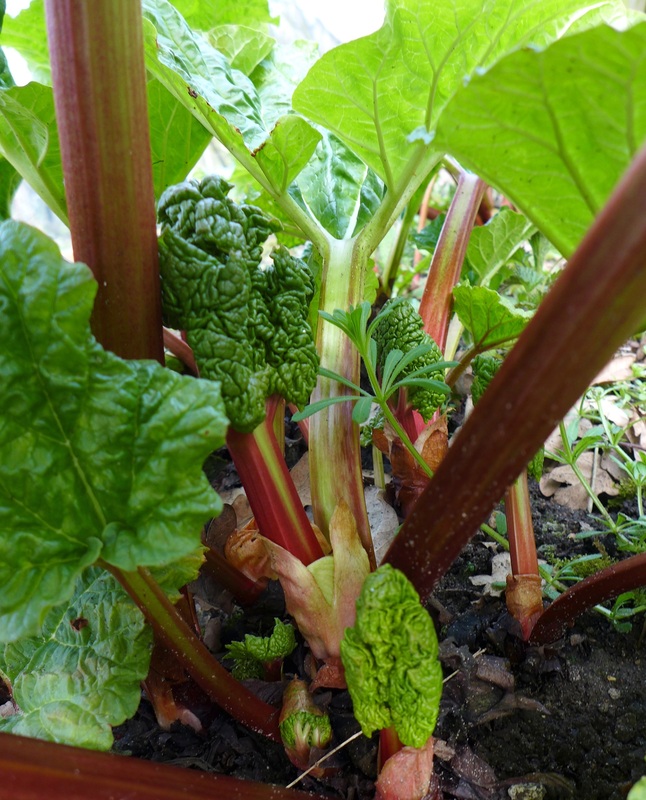 It’s been such a long winter but the first tender young stems of rhubarb are finally springing up in the kitchen garden. 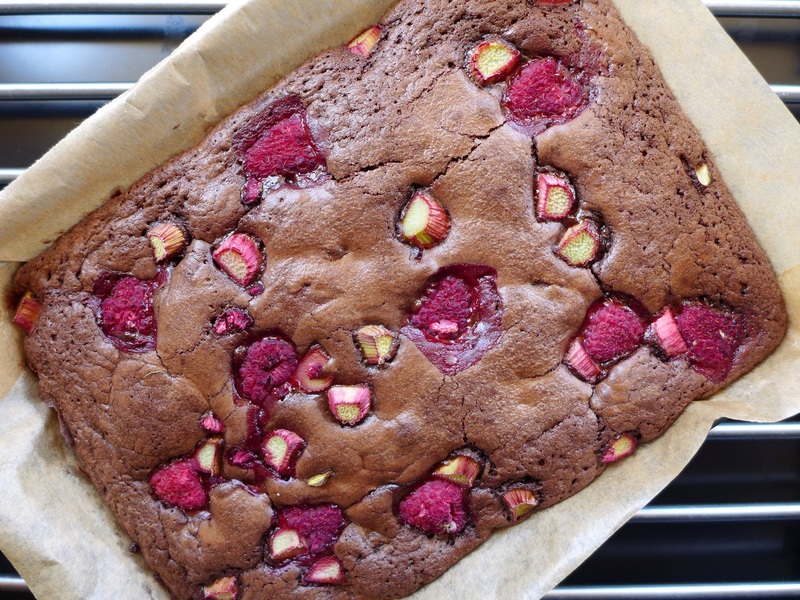 There aren’t enough yet to go to town with but I really wanted to taste some, so I mixed a few stalks with a handful of last year’s frozen raspberries to make this sumptuous brownie. I love the contrast between the rich, sweet chocolate and the sharp fruit. 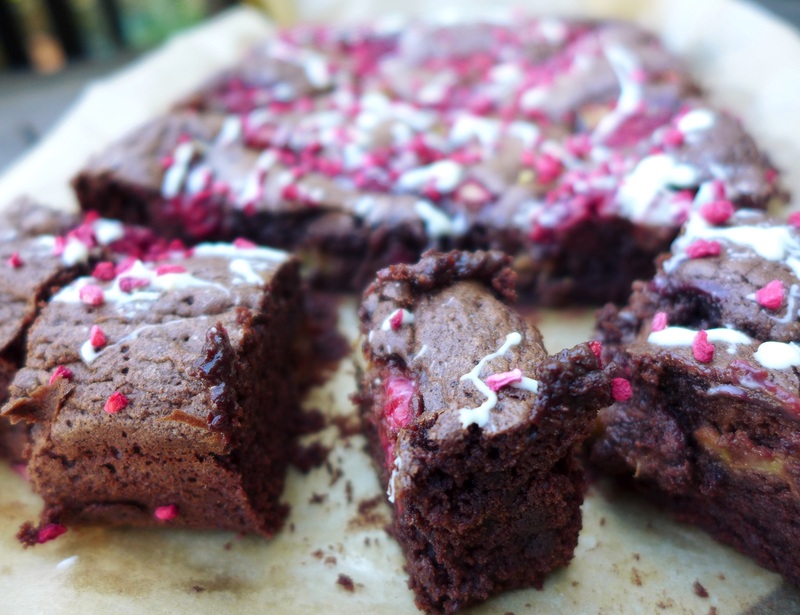 There are so many brownie recipes and you may prefer to adapt your favourite, but this one works for me. I have found that with a wetter mixture it needs slightly longer in the oven, something I’ve reflected in the method given below. It’s always better to err on the side of caution with a brownie though – I think one that’s too fondant-y in the middle is better than one that’s dry. You don’t have to decorate the top – it looks good just as it is, see main picture – but I was having a Jackson Pollack moment. (Stop with the rhyming slang, already.) If you do opt for the white chocolate drizzle, try to find one with a high cocoa butter content, otherwise it’s apt to seize and go lumpy when you try to melt it. I use bags of couverture chocolate drops, available in dark, milk and white. They aren’t cheap but last for ages (if you can stop yourself dipping a hand in every time you go past the cupboard). Callebaut is a good make. Pre-heat the oven to 160C fan/180C/350F/Gas Mark 4 and line a 22cm square or 27x20cm rectangular brownie tin with baking or silicone paper. 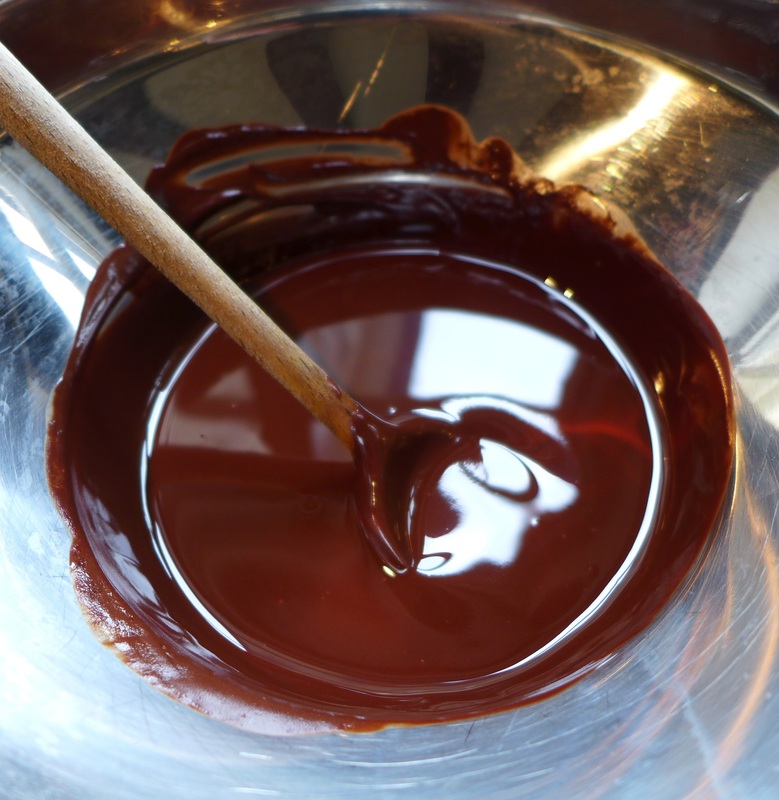 Melt the butter and chocolate in a bowl over a pan of simmering water, making sure the base of the bowl doesn’t touch the water. Take off the heat and cool to room temperature. Beat the eggs and sugar in a bowl until doubled in size. If you lift the whisks out of the mixture you should be able to see ribbons on the surface as it drips back into the bowl. When the chocolate is cool enough, pour it into the eggs. It will sink to the bottom, so using a rubber spatula, gently scoop it up from the base and mix it into the eggs with a figure of eight motion. Try not to knock all the air out. Sieve the flour, cocoa and baking powder into the bowl and mix in again using the same gentle figure of eight movement. Fold in half of the fruit, then pour the mixture into the lined tin. Scatter the remaining rhubarb and raspberries on top. Bake for 25-30 minutes, until the top is shiny and cracked but the inside is still wobbly. Remove from the oven and cool completely. You can stop at this point, or …. … melt the white chocolate in a pan over simmering water, pour into a piping bag (or a food-safe plastic bag with the corner snipped off) and drizzle the top of the brownie. Scatter over the freeze-dried raspberries and leave to set before cutting into squares. 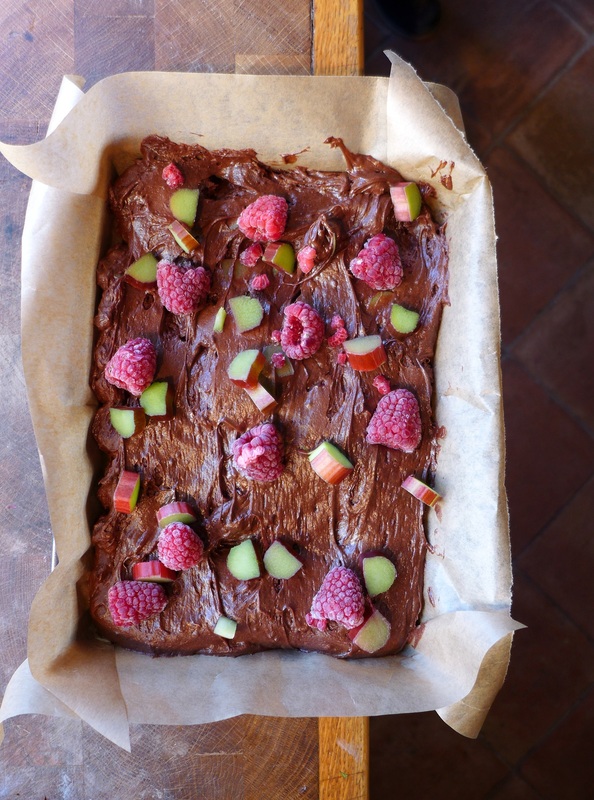 This entry was posted in Desserts, cakes and biscuits and tagged chocolate brownie, rhubarb and raspberry brownie, rhubarb recipes by Linda Duffin. Bookmark the permalink. Thanks very much! I was pleased with the way it turned out. Have a great weekend. L.
Oh, this sounds so good, Linda! My rhubarb is still under a foot of snow, but it won’t be long now! Thanks, Cindy. Brrr! It’s finally starting to feel like spring here, hope it soon warms up at Beaver Island! Brilliant! And as I live near the Rhubarb Triangle there’s no excuse to give this a go. You are lucky! That pink forced rhubarb is so lovely to work with. All sounds delicious! You do need the pink rhubarb for the gin, I think, it turns such a lovely colour. Get the glassware out, we’re on our way! I know how delicious raspberries are in a brownie but never thought to add rhubarb, bet it’s delicious. Another recipe on my must try pile..
Wow ! This is awesome !! a couple of weeks ago I tasted new season english garden rhubarb, very young and slender, the stalks might have been 30 cm long, ranging from green to light purple: excellent taste and texture (as good as any young forced rhubarb). I was then reading an old Derek Cooper’s article about rhubarb: I had never realised there are very many variety of rhubarb (he praises cherry rhubarb in particular). Oh my gosh this is gorgeous!! !